Can I Play Lebanese Loto Online? Read Reviews! Lebanese Loto Exposed — How about Getting Your Hands on Some Middle Eastern Riches? Lebanon is a small country on the coast of the Mediterranean Sea and apart from having beautiful beaches, it also has a fun lottery. 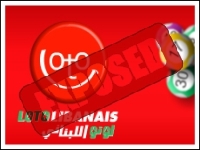 Called Loto Libanais and featuring a smiley face as its logo, this opportunity is definitely a good one to explore. Loto Libanais is one of the games in the portfolio of the La Libanaise des Jeux. It’s been around for a relatively long period of time, but in 2002, the game underwent rebranding and a relaunch. This is also the year when it got its distinctive logo that spells out the word Loto in the form of a smiley face. This is a distribution-style draw game, which means that prizes depend on the number of players and the funds that have been collected through ticket sales. Originally, the game featured a single drawing per week. Due to massive interest, however, a second one was added in 2003. Today, Lebanese Loto drawings occur every Monday and Thursday. They’re broadcast live at 7:30pm on a local TV channel. Is Lebanese Loto a Scam? Since you’ve probably never heard of Lebanese Loto before, you may be worrying that it’s a scam. There’s no reason for concern. The lottery is run by a national entity and it’s a completely legitimate one. La Libanaise des Jeux is an exclusive lottery operator in the country. It’s been doing a stellar job developing new games and raising revenue for Lebanon’s national budget. This is the main reason why the concessionaire had its original contract extended for 8 more years in 2016. Today, the company has an extensive range of games in its portfolio. Apart from La Libanaise des Jeux, it also operates draw lotteries like Zeed and Yawmieh (the newest addition to its range). A very wide selection of scratch games is also available. About 40 percent of the funds generated through the sale of tickets go towards the national budget. In nine years of operation, La Libanaise des Jeux has also handed out more than 301 million dollars in the form of prizes. All of these numbers stand as evidence of fairness and safety. You can give the Lebanese Loto a try without worrying about being scammed. How to Play Lebanese Loto? Lebanese Loto comes with a straightforward format. It’s a 6 out of 42 game. Apart from the jackpot that you’ll get to win by matching all of the numbers for the respective drawing, the game also features 4 additional prize tiers. The price of each ticket is 2,000 LBP or about 1.32 US dollars. Players can go for one numerical selection (of six numbers), 2, 4, 6 or 8 per ticket. Obviously, the number of grids chosen will impact the price of the ticket. Loto Libanais also features systems that increase the odds of winning the highest prize. Opting for a system of 7 numbers will increase the cost of the ticket from 2,000 LBP to 14,000 LBP. A system of 10 numbers is the biggest one and it costs 420,000 LBP (277 dollars). Anyone looking for a game that has a rolling over jackpot will like Loto Libanais. If there’s no winner of the respective drawing, the amount will roll over towards the next one. The odds of winning the jackpot are 1 in 5,245,786. Currently, the jackpot is set at 743,804,021 LBP or slightly over 492,000 dollars. It’s pretty interesting that some of the biggest jackpots in the history of the game have accumulated during the Christmas season, making someone quite a lot happier during the holidays. The biggest jackpot in the history of Loto Libanais fell in 2006. It reached the unparalleled four million US dollars, reaching international headlines. Because of the massive sum, people across the country ended up queuing in front of the lottery ticket sale venues, hoping they’ll get their hands on the big cash. Previously, a massive jackpot was won in 2003. The sum reached approximately three million dollars prior to getting snatched. Apart from the jackpot, there are 4 additional prize tiers. The total amount for each is usually announced after the drawing. This sum is split among all of the individuals that have the respective number of correct digits. In the latest drawing, for example, the second prize tier produced 297,481,238 LBP (196,825 US dollars) per person and there has been just one winner. The smallest prize was handed to the people who got 3 numbers for the respective drawing and it was 8,000 LBP (5.29 USD) per person. Lebanon has somewhat weird taxation regulations that will apply to some of the Loto Libanais prizes. Players who win 5 times or more the amount they invested in the purchase of a ticket will be subjected to a 10 percent income tax. A lottery receipt will have to be presented at a point of sale for the money to be paid out. Players have up to 4 months after the date of the drawing to make a prize claim. Individuals who have won the jackpot, the second or the third prize tiers will need to make a claim at the La Libanaise des Jeux headquarters in Beirut. Can You Play Lebanese Loto Online? La Libanaise des Jeux is committed to modernizing the lottery in the country. This is the main reason why the company has made it possible to purchase tickets via SMS and an online portal. The good news is that even players from abroad can join the Loto Libanais website and buy tickets online. A payment can be made with a credit card, a debit card or a wire transfer deposit. Would you mind rating Lebanese Loto? If you’re not frazzled by any of the shortcomings, you should give Loto Libanais a try. Low ticket price and the ease of acquiring your 6 lucky numbers both justify testing out the opportunity. Some people might not know this, but playing lotteries without bonus number actually increases the chances of winning. It’s always so frustrating when you think you got a number correct, but later realize it came out as a bonus number while you picked it as a regular number.